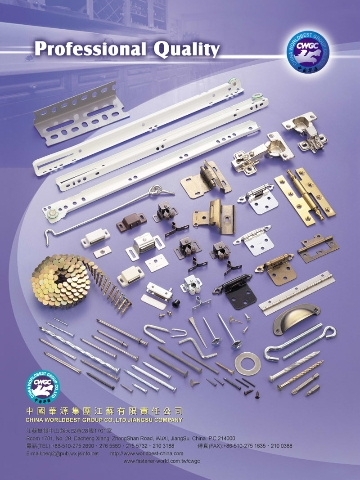 CHINA WORLDBEST CO. LTD IS A PROFESSIONAL FASTENER TRADING COMPANY WHICH POSSESSES INDEPENDENT IMPORT AND EXPORT OPERATION RIGHTS. SHE IS MAINLY ENGAGED IN MACHINERY FACILITY, INDUSTRIAL EQUIPMENT, AND UNIVERSAL HARDWARES, WITH ABUNDANT CATAGORIES, MORE THAN ONE HUNDRED SORTS. SINCE HER FOUNDATION, ACCORDING TO HER EXCELLENT WORKING GROUP, RICH TRADING EXPERIENCES AND HIGH QUALITY SERVICES, SHE HAS BEEN ENJOYING AN EXTRAORDINARY AND BIG-LEAP-FORWARD DEVELOPMENT, WITH HER BUSINESS TOTALITY, PROPERTY TOTAL AMOUNT IN VALUE AND EXPORT BUSINESS HAVING DOUBLED IN SUCCESSION FOR YEARS, AND HER IMPORT-AND-EXPORT BUSINESS TURNOVER MORE THAN 15 MILLION DOLLARS IN RECENT YEARS. FOR YEARS, OUR COMPANY, GUIDED BY THE DEVELOPING AND AMBITIOUS SPIRIT---EXTRAORDINARY, PIONEERING, MUTUALLY CO-OPERATIVE AND PROGRESSING, HAS BEEN TAKING AN ACTIVE MEASURE TO WIDEN THE DOMESTIC AND FOREIGN MARKETS, AND OWN CUSTOMERS FROM MORE THAN 30 COUNTRIES AND REGIONS IN EUROPE, AMERICA, AFRICA, AND ASIA, THUS HAS ACHIEVED GREATER ACHIEVEMENTS AND WON A BETTER FAME. WE SINCERELY WISH TO ESTABLISH A CLOSE AND ECONOMIC COOPERATIVE RELATIONSHIP WITH ALL THE PARTNERS BOTH AT HOME AND ABROAD SO AS TO ENJOY A MUTUAL DEVELOPMENT.